Off to Japan, USA,UK,Switzerland,Portugal,Canada, The Netherlands,Israel,Finland, New Zealand,New Caledonia and of course all over Australia. 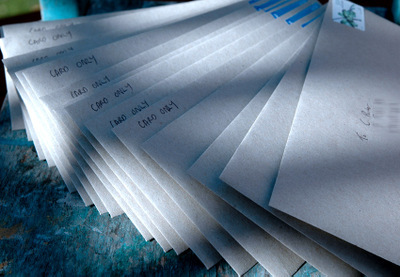 I love snail mail...hope you enjoy finding these in your mailbox, where ever you are! All feedback encouraged and most welcome. 8th March....Thanks for the great response. All of the mini zines are now spoken for...only did an edition of 50 (quite enough folding and stapling for the present!) so if you missed out, sorry!